This is the film that finally proves Marvel head Kevin Feige really really knows what he’s doing. Bring on Phase Three! Made for Marvel fans wanting something new and anyone looking for some big laughs. If there was any film to prove Marvel Studios fallible, everyone thought it would be Ant-Man. Plagued with production issues including original nurturer Edgar Wright walking away weeks before filming to on-set rewrites. And the questionable choice of replacing Wright with Peyton Reed (Bring It On, Down With Love, The Break-Up, Yes Man), was this the one to finally ruin an 11 film winning streak? Well, now it’s official: Marvel can do whatever they want. Ant-Man rises above all its behind-the-scenes troubles and manages to deliver one of the summer’s funnest movies. It’s not just another notch on the Marvel Cinematic Universe belt of greatest hits, but winds up staking claim as being an inventive, hilarious, and even heartwarming film. Beginning in 1989, S.H.I.E.L.D. is holding a meeting with Peggy Carter (Hayley Atwell), Howard Stark (John Slattery), and Mitchell Carson (Martin Donovan), when Hank Pym (Michael Douglas) interrupts. The subject on hand is Hank’s “Pym Particle” which he’s not handing over, something S.H.I.E.L.D. is desperate to get their hands on, turning Hank into an enemy. In present day, Scott Lang (Paul Rudd) has just been released from San Quentin after being imprisoned for corporate espionage. Soon enough, his past comes calling when his best friend Luis (Michael Peña) lets him in on their next big score. Turns out, a lonely old man has something big locked up in a safe, and after Scott’s ex-wife Maggie (Judy Greer) and her fiance Paxton (Bobby Cannavale) get in the way of him seeing his daughter Cassie (Abby Ryder Fortson), he turns to what he does best. 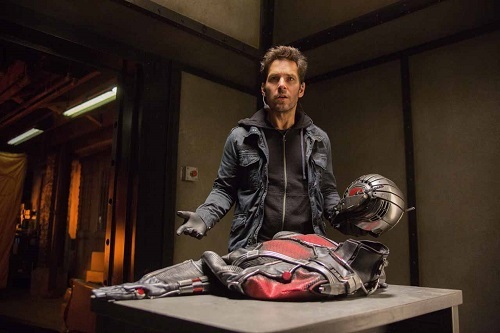 This leads him under the wing of Hank and his daughter Hope van Dyne (Evangeline Lilly), to become the Ant-Man and save the world from Darren Cross (Corey Stoll), who’s finally cracked the Pym Particle and wants to use it to create an army of miniature super soldiers to sell to the highest bidder. The most surprising aspect of Ant-Man is that — while it may have a heavy dose of originitis — this may be the least action-oriented Marvel movie yet. Don’t get me wrong, there is plenty to keep one satisfied, but there is way more story and character than we’ve become used to from Marvel. It probably helps that the film is a comedic-caper first, action-blockbuster second. The story works because we care about Rudd and his longing to have a happy/healthy relationship with his daughter. It never gets caught up in Scott trying to win Maggie back, and even Paxton never turns into a manipulative antagonist. There is one villain in Ant-Man and it makes for a much more streamlined story. Reed was an odd-ball choice as director — although he was supposed to direct 2005’s Fantastic Four — but boy does he deliver. The laughs are big, the jokes fly fast and furious — a particular cameo will leave the sharpest viewers in stitches. The Marvel Cinematic Universe continues to link into an even bigger unit, and there’s no way you’ll leave dissatisfied. Ant-Man has it all, and even Rudd manages to make for a fantastic superhero, as odd as his casting may seem. It probably helps that he co-wrote some changes to Wright and Joe Cornish’s original script (Attack the Block, The Adventures of Tintin) with the help of funny man Adam McKay (Anchorman, The Other Guys). Just the writing team alone is enough to let you know what you’re getting into. McKay knows how to write for Rudd, and knows how to write action. Be sure to stick through the end credits as there are two scenes, one mid-credits and another post credits. Rest assured, every minute of Ant-Man is worth seeing. This is the film that finally proves Marvel head Kevin Feige really really knows what he’s doing. Bring on Phase Three!